Relaxed and in a new state of mind, participants can soak in the woodland atmosphere of ‘Forest Bathing’ by emerging artist Melinda Marshman, whilst sipping the purity of Botanical Signature's herbal teas. Bringing the natural world to Paddington, Melinda Marshman depicts the calming energy of forests in her latest body of work inspired by the Japanese practice of Shinrin-Yoku. Following on from her successful 2018 exhibition at Saint Cloche ‘ROAD TRIP’, this new body of work is inspired by the concept of Shinrin-Yoku, or ‘Forest Bathing’ applying the concept to the Australian Bush. The Exhibit is a new, up and coming online platform for artists and curators to exhibit and sell work. You can visit my latest exhibition ‘Twilight, Daylight, Autumn, Spring’ here on The Exhibit https://theexhibit.io/exhibition/twilight-daylight-autumn-spring ‘Twilight, Daylight, Autumn, Spring’ showcases my abstract explorations of the landscape. My exhibition opens on 27 October 2018 at 11:00 AM AEST. 'Twilight, Daylight, Autumn, Spring' showcases a series of evocative oil paintings that offer an intimate vision of the landscape. The subjects explored are from the artists travels afar, or just around the corner. These intimate vignettes are glimpsed from a car, experienced on a walk or viewed from a window. Rich in subjectivity these works celebrate both the majesty and simplicity found in nature with compositions that zoom in on a meditative part of a broader whole. The palette reflects the seasonal colour and joy she feels in the landscape. Pink is a reddish hue that lies between the pure neutrality of white and the energy and passion of red. Pink is sensual. Pink can be mischievous. Nostalgic. Delicate or punk-rock. It is colour of girls. The lips and the tongue. Flesh and flower. The glutton. The colour of the blush on the skin and the sky at dawn. 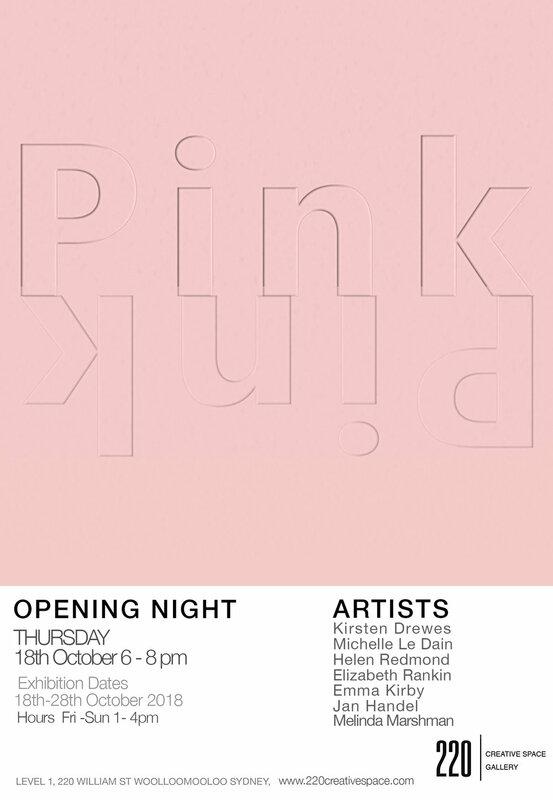 From pretty to gritty: seven artists celebrate the complex, contradictory and implicit power behind the colour pink. In Kirsten Drewes’ felted soft sculptures, Jan Handel’s interplay of colour and form, Emma Kirby’s material alchemy, Michelle Le Dain’s playful photo montages, Melinda Marshman’s spare and reductive paintings, Elizabeth Rankin’s darkly romantic drawings and Helen Redmond’s architectural spaces, implications and interpretations are extracted and distilled from the spectrum’s most enigmatic pastel. The artworks within the space can be read both separately and as one diverse installation. A conversation with a colour. Little Things Art Prize 2018 is supported through the Woollahra Council Community & Cultural Grants program. “Between every two pine trees is a doorway leading to another life”. This quote from naturalist John Muir, illuminates the philosophy behind the Japanese practice of Shinrin- Yoku or ‘Forest Bathing’. This is the medicine received by simply ‘being’ in the forest. The practice requires a mindful presence with nature. Living in the now is the natural state of nature, teaching us to react only to ‘what is’ – not what might be or once was. Resilience requires patience, tenacity and above all being present, nature embodies these qualities and so is a source of nourishment, empowerment and wisdom. Inspired by the concept of Shinrin - Yoku I wanted to invoke the sensation of forest bathing but applied to the Australian bush. The Australian gum tree is very well adapted to weathering the harsh environment it inhabits. Through seasons of drought or bushfire, the bush is in a constant state of renewal and adaptation. Making studies for this painting en plien air became a mindful practice and revealed layers, colours and beauty not previously seen. Medicine received.